Molded in Polypropylene, this flask stand gives a stair-like top view. Every step provides excellent support to round bottoms flasks at every point of contact. Convenient access to Kimwipe® or Accuwipe® brand wipers. Instant installation with double-faced tape . Size: 10.25" Wide x 4. 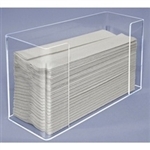 Protect your pipettor tips by storing them on these angled Pipettor stands. Create order and brighten your work space. Unbreakable Dispenser keeps Towels Dry and Easy to Use. (Holds up to three stacks of tri-fold paper towels. PVC construction in three lengths. Packaged in pairs. Storing protective apparel, like latex gloves, in convenience locations around your lab, office or workplace ensures your safety. Gloves only work however if you know where your glove supply is; how many gloves you have on hand and you have be able to get to them when you need them. Small Biohazard Shield 8" x 18" x 10"
Acrylic biohazard shield 8" W x 18" high x 10" Deep. Splash protection with unobstructed view.